Denise has seen a listing of the Goffa dog, and she says it does not look right to her. So we need to concentrate on finding a GUND dog, instead. I am looking for a white puppy with blue ears, tail, and nose. I thought it may have been a Gund but cannot find another. It is my son’s favorite and is getting ratty. If you can help Denise find this GUND? Goffa? White and Blue Puppy, THIS SITE IS NO LONGER ACTIVELY MANAGED. Please use Our FREE FACEBOOK GROUP, including #040708-4 in the subject, . You may be right! 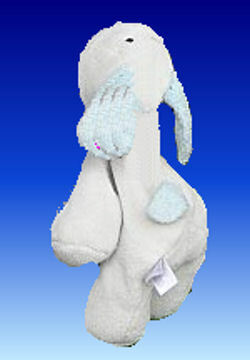 We sold a white elephant with blue ears of the same style as several GOFFA beige animals with darker ears. The dog we sold was the same shape as this dog is.